HispanicNashville.com: Immigrants without a May 1 event in Nashville? May 1 is a day in which immigrants have mobilized themselves in the past few years, and 2009 is no exception, but Nashville seems to be taking a pass this year (see the lists here, here and here of May 1 events across the country, none of which is in Nashville). * CALL: President Obama and thank him for moving immigration reform in 2009.
o For English call: 866-584-3962. Between April 15th and May 31st national organizations, grassroots groups, faith-based congregations and individuals across the country are coming together in a nationwide effort to share Emmy-winning Made in L.A. and put a human face on the issues of immigration, immigrant workers' rights, and supporting humane immigration reform. 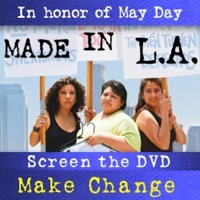 To learn more about the campaign, and see our short web-videos, visit our May Day Community Screening Campaign page! Join the movement and start planning your own Made in L.A. event today! Is there a Nashville May 1 event I'm missing? Does anyone know if there are any Made in L.A. screenings in the works for Nashville? Anyone want to put one together? Contact me here or comment below.